MOSCOW, Russia -- Ukraine may join a customs union formed by its ex-Soviet peers Russia, Kazakhstan and Belarus, the Ukrainian president said Friday, casting doubts on Kiev's hopes of a free-trade pact with the European Union. Russia's Medvedev (R) and Ukraine's Yanukovych. "This is possible, but there are procedures we need to go through in Ukraine such as amending the constitution, which can be done either by the parliament or through a referendum," Viktor Yanukovych told reporters after meeting with Russian President Dmitry Medvedev. The two sides have stated a desire for their trade volumes to reach $40 billion. Ukraine is in talks with the European Union on signing an association agreement that includes a free-trade deal, but Brussels has not promised it EU membership or proposed that it be given EU-candidate status. Joining the Russia-dominated trade bloc may hamper a deal with the EU because the customs union has a common foreign-trade policy with tight links to Russia. Russia pushed through the customs union after losing patience over its bid to join the World Trade Organization. Russia, Belarus and Kazakhstan signed a macroeconomic policy coordination agreement last week, a key part of their drive to create a free-trade zone in 2012. The talks between Medvedev and Yanukovych resulted in an agreement from Ukraine to cut transportation rates for Russian crude at its ports by 50 percent and increase oil imports. Russia will ship 18.5 million metric tons of oil a year to Ukraine for processing at refineries and further export, Russian Ambassador Mikhail Zurabov told reporters Friday. The amount exported further will depend on how much Ukraine uses, he said. 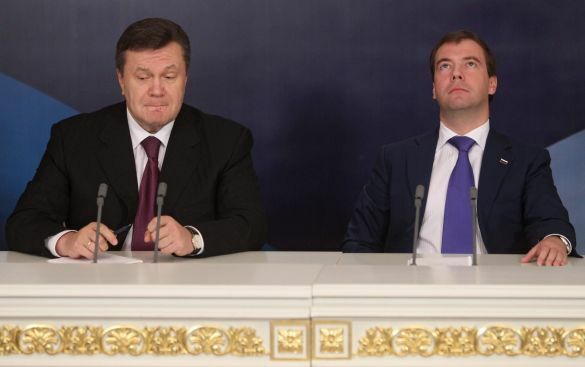 Medvedev and Yanukovych also discussed gas prices. The Russian president said the two countries need to “find such compromises” on energy issues that will allow their economies to develop. During the presidential visit Gazprom chief executive Alexei Miller told Ukraine Energy Minister Yury Boyko that the company would consider contributing deposits from the Astrakhan region on the Caspian Sea to a proposed joint venture with Naftogaz. Since coming to power in February 2009, Yanukovych has tilted Ukraine's foreign policy toward Russia, abandoned the goal of joining NATO and extended the deal under which the Russian navy uses Ukrainian Black Sea facilities. OH the great bear thinking to himself OMG ...What is he saying!